Polish Unitarian priest; born at Zbaszynie about 1530; died 1613. Czechowic lived at a time when religious restlessness was prevalent in Poland. Numerous religious sects arose, varying from the old Catholicism and the new Reformation to sects which rejected the Trinity and denied the divinity of Jesus. The members of the sect which professed disbelief in the Trinity were called Unitarians, and the most radical among them were called by their opponents "Half Jews." The religious dissension and constant disputes which arose in consequence led to a number of Jews taking part in these disputations. Martin Czechowic frequently changed his religious views. He was a Roman Catholic priest in Kurnik until 1555, when he became a member of the Bohemian Brotherhood in Wilna, and, in 1575, wrote in denunciation of the baptism of infants (Lublin, 1575). He also wrote a book endeavoring to show that the objections of the Jews to Jesus as Messiah were unfounded. It was published under the title "Rozmowy Chrzescijanskie o Tajemnicach Wiaru" (Rakow, 1575). In reply to this, Rabbi Jacob Naḥman of Belzyc wrote a defense entitled "Odpis Jacoba Zyda z Belzyc na Dialogi Marcina Czechowiza" (Lublin, 1581). The arguments of Jacob Naḥman were able and logical, and called forth a reply from Czechowic, entitled "Vindiciæ Duorum Dialogorum Contra Jacobum Judæum de Belzyce." 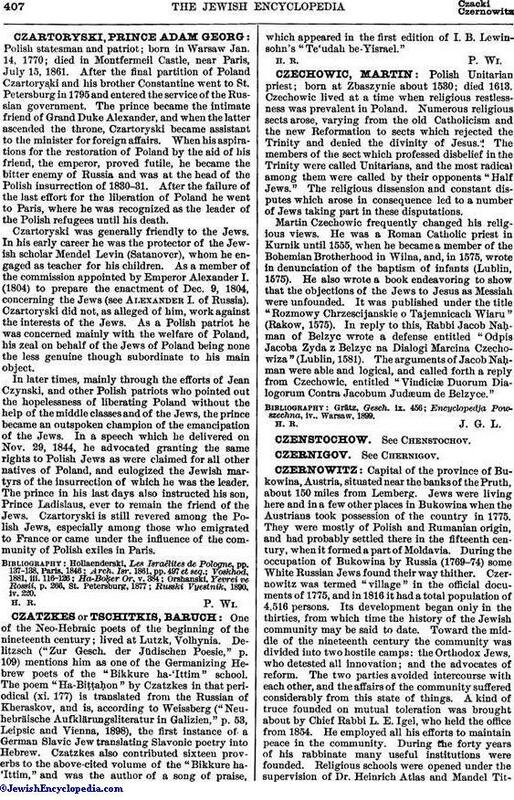 Encyclopedja Powszechna, iv., Warsaw, 1899.